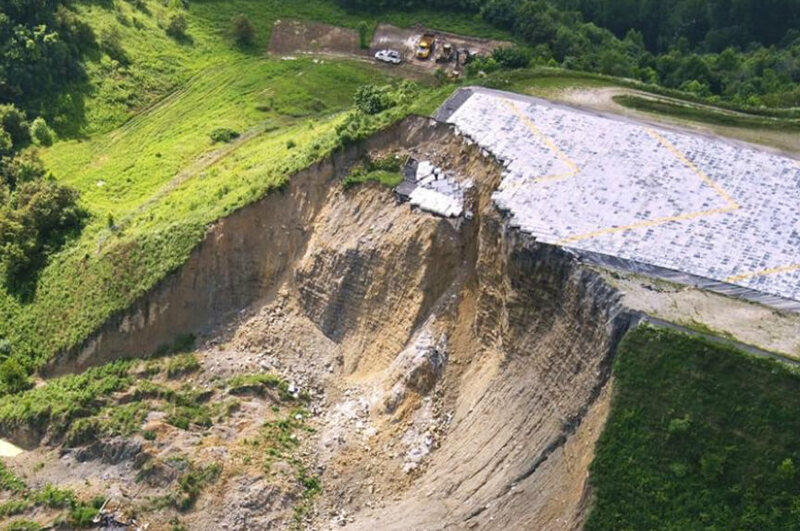 In 2015, one of the tallest engineered slopes in the United States experienced a landslide at the end of Runway 5 at Charleston Regional Airport in Charleston, West Virginia. The slope failure not only resulted in significant damage to a church, several residences and local infrastructure but also caused damage to a portion of the EMAS structure at the end of the runway. Schnabel Engineering was retained to design the repair of the slope to restore full runway operations. Orders Construction, and their consultant CTL Engineering, were retained to build and monitor construction activities before turning the sensemetrics monitoring platform over to the Owner. Due to damage of the EMAS structure as well as the underlying engineered slope, the City retained Schnabel Engineering to both design a permanent repair restoring Runway 5 to fully operational status in accordance with FAA requirements, and implement a permanent structure monitoring solution to prevent a serious slope failure from reoccurring in the future. As part of the ongoing monitoring solution, Schabel wanted to implement a platform that was flexible, easy to implement, and could easily be turned over for monitoring to airport engineers once repairs were complete. The sensemetrics platform monitored the structure during construction, ensuring safety and preventing further damage to surrounding areas. Additionally, sensemetrics is now actively monitoring the structure, providing streaming condition monitoring and sensor data using our secure CLOUD platform in accordance with project design requirements. The selection of sensemetrics’ CLOUD based monitoring platform has allowed for improved asset management awareness based on carefully designed sensor selection and placement, providing for critical geotechnical information, on demand. The Project Team can now make informed decisions based on real-time data that is critical to airport infrastructure and the surrounding private assets. Using a 4 hour reading frequency, the project will have a nearly a 100% chance of detecting exceedance of set thresholds within a 6 hour window.